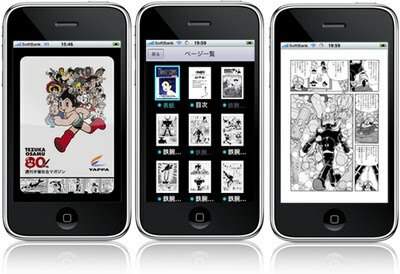 During Tezuka Month you may have seen my breathless news post about how the Astro Boy iPhone app had been expanded to new countries, including my own native land of Great Britain. As previously mentioned, I had been aching to get my hands on the app since learning of its existence and cursing the arbitrary barriers preventing me from doing so. So now that I actually have Weekly Astro Boy Magazine firmly installed on my iPhone, was the wait worth it? To recap, the app allows you to read translated chapters of famous Tezuka manga such as Black Jack, Astro Boy and Dororo, on your iPhone or iPod Touch through a devoted e-reader application. The chapters are arranged into volumes which are released weekly for $1 (or your local equivalent) each, with the selection of manga on offer differing each week. You can pick and choose which volumes you download, so there is no obligation to keep forking out money. First things first, this application is only available for the iPhone and iPod touch — no other handset types are covered so it you just bought a shiny Android (or any other mobile OS) device you are out of luck. Sorry! In the app store you will find two versions of the program — a free version with a single issue of the magazine and a paid, $1 version with the first two issues. This is a rather confusing decision given the two could have easily been rolled into one free app that charged you for the second issue. Of course, this could be due to some bizarre rule on Apple's part regarding in-app purchases. Once downloaded, you can buy additional issues of the magazine from within the program, which would be a wonderful way to take the hassle out of getting more content if it was not for two major problems. First, the purchasing and downloading system is very slow, and it often takes multiple attempts to confirm your purchase of a new volume. The app then takes an irritatingly long time to download your purchased content and has a tendency to fail to complete a download. These frequent failures are infuriating; it is a blessing that the application can resume partial downloads otherwise I would have quickly given up on using it. Due to these frustrations I tend to only download new issues of the magazine when I am work, where I can abuse the powerful wireless connection to get issues in a quarter of the time with fewer errors. A minor note to add here is that, without fail, each time I have downloaded a new issue I have received “Download failed” error at 99% complete only to have it show up, completed, in the program. The second major problem with the program, and one that is entirely out of the hands of the publishers, is that while the app is downloading you are unable to do anything else on your device. Remember, no multi-tasking on iPhone OS! (At the time of writing, using OS 3.2) This includes viewing already downloaded issues. Add this to the frequent failures experienced while downloading and the entire process begins to become more and more unappealing. With all that technical rigmarole out of the way, how does it perform when you view the manga you have downloaded? Very well, actually. I must admit I was rather dubious about viewing manga on the iPhone screen as I presumed it would involve an awful lot of moving the page to view the art in detail. I was pleasantly surprised to find that you can read a full page in the portrait orientation quite easily, although the finer details are lost on the more lavish titles included in the magazine. Zooming in/out and moving around the page are smooth and responsive and feel no more obstructive than using a physical book. There is a small delay when displaying a new page as the program loads the image, although this only manifests should you have your device playing music at the time and does not impact the viewing experience. It is also easy to confuse the application at times — should you accidentally turn the page, any attempt to stop it will confuse the program and you have to wait for the transition to complete before making any additional movements on the touchscreen. This may be an issue of an idiotic user however, as I am rather clumsy and tend to use the app while on a bumpy commute. So far it feels like I am griping, but all of my complaints are incidental points - slip-ups on the path to greatness. The simple fact that this app exists and that it works as intended is a small marvel. For the equivalent of $1 you get a sizeable chunk of manga from a range of Tezuka's works, some of which may be difficult to get a hold of where you live. I personally have never seen a physical copy of Adolf, and the opportunity to read it in any form is wonderful even with the niggling issues attached. Plus — and this is a definite positive for me — it will not clutter your already overloaded bookshelf. NOTE: At the time of writing, the iPad is not available in the UK, and so I have been unable to review this app on this new platform. The iTunes store lists that Weekly Astro Boy Magazine is compatible with the iPad, however. If you are lucky enough to have an iPad, please try the free version of this app and let us know how it is in the comments below! This review is based on the March 2010 version of the iPhone application, purchased by the reviewer.